Speaking as someone who watches far more TV than I probably should, it seems like a no-brainer that the iPad is an ideal platform for viewing video—perhaps more than the iPhone ever was. I’m not alone in such thoughts, it appears: the news has been flying fast and furious in the last day that video content providers are planning to bring their wares to the iPad. Let’s round up the usual suspects. The Wall Street Journal reports (with its usual paywall shenanigans) that both CBS and ABC will be streaming TV shows to the iPad. CBS will opt for video that you can watch through Safari on the iPad—as we reported last week, the network has already been running tests of HTML5-served video. As of Saturday, when the iPad launches, CBS plans to have full episodes of popular reality show Survivor available, as well as clips from other shows. At some point in the future, however, the network is shooting for full parity between what’s offered on its standard Website and on the iPad. ABC, meanwhile, is taking the full-blown app route. Screenshots apparently obtained from Apple’s own App Store database show the ability to skim through the network’s program listing and stream episodes, but it’s hard to tell much else. The Journal’s report suggests that both ABC and CBS will stream their videos on an ad-supported basis, much as they already do online. That may poke a hole in Apple’s attempt to coax the network’s down to a 99 cent price point for selling TV shows. Meanwhile, major video-streaming player Netflix also appears to have an app coming down the pipe, much to the joy of Instant Streaming fans everywhere. While a survey last month gauged the interest of a Netflix app for the iPhone, the company has kept its plans close to its vest. There’s not much known of the prospective iPad app beyond the screenshots on Apple’s servers, which show what appears to be Netflix’s familiar red interface running inside an iPad app and a movie playing back in an iPad video player. Still, even the possibility is enough to inspire shortness of breath and dizziness. For those with a fondness for Web-based streaming video, you’ll be happy to know that Flickr has joined the club pioneered by YouTube, Vimeo, and Brightcove. The popular photo-sharing site (which added video in 2008) announced on Wednesday that it will now serve up its videos in tasty HTML5-served format. 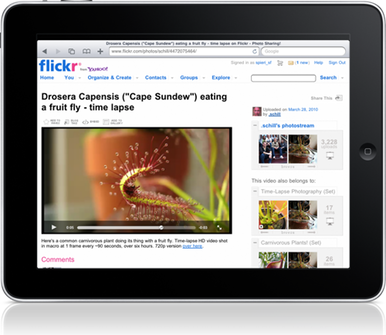 Surf over to Flickr on an iPad, and you’ll automatically be presented the compatible format. With all this talk of video-streaming, though, there’s one name that’s been conspicuously absent: TV-streaming site extraordinaire Hulu. While the venture—which is owned jointly by NBC, Fox, and ABC—has remained mum on its plans, no less than The New York Times reported on Thursday that a Hulu iPad app is in the works. Of course, we’ve heard this before; rumors of an iPhone app for the site go back almost a year. But combine it with another long-rumored idea, that Hulu is working on a subscription service, and there may be some traction. The Times says that Hulu may test a subscription service first on an iPad application, though details are, obviously, scarce. No matter which way you slice it, it’s clear that content providers are eager to use the attention on Apple’s latest product to drive eyeballs to their content, and in the end that’s a win for the users. Video streaming on the iPhone never seemed to really catch on, though you could easily argue that the iPad is better suited for video consumption. And if the iPad ends up succeeding in this regard, it’s certainly reasonable to suggest that some or all of that success might wash back on the iPhone.